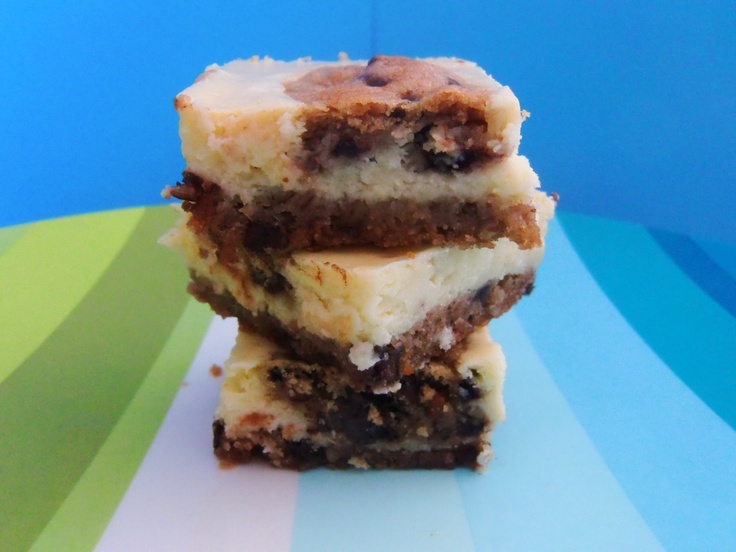 Chocolate Chip Cookie Dough Cheesecake Squares! Cream butter and sugars until light and fluffy! Beat in egg and vanilla. Combine flour, salt and baking soda. Gradually add to creamed mixture until combined. Fold in chocolate chips and pecans. Set aside 1/3 of dough for topping. Press remaining dough into greased 9 x 13 pan. Bake at 350 degrees for 8 minutes! Meanwhile, beat cream cheese and sugar until smooth. Beat in eggs and vanilla. Spoon over crust. Drop spoonfuls of cookie dough over filling! Bake at 350 degrees for 35-40 minutes or until golden brown. Store in refrigerator! Makes 3 dozen scrumptious bars!